Snow falls on a deserted Windsor lake. 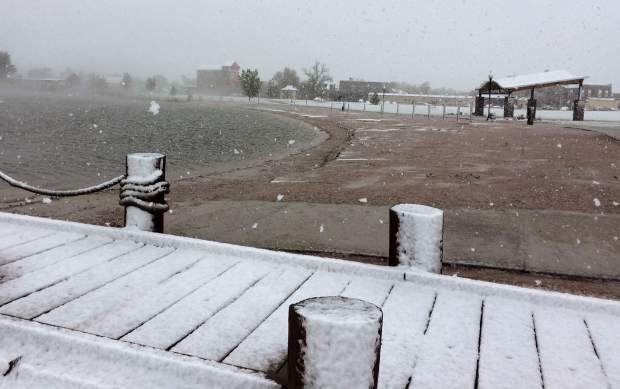 Snow started falling in Greeley and Windsor about 1 p.m. Thursday. National Weather Service forecasters also issued a flood advisory for Greeley, Windsor and much of Weld County. 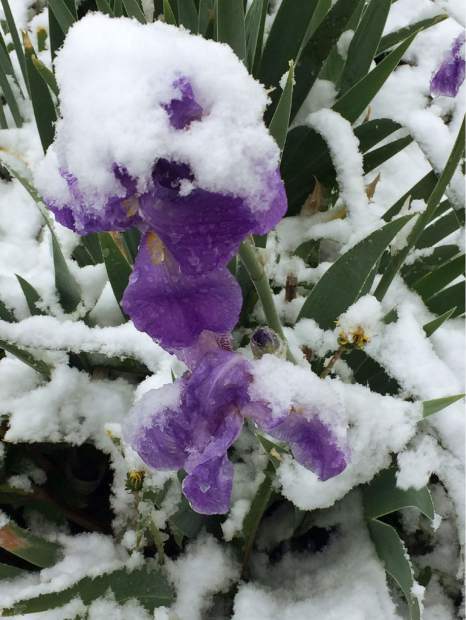 Snow falls on a flower already in bloom. Snow accumulates in Windsor. Snow began falling in Windsor and Greeley about 1 p.m. The National Weather Service also issued a flood advisory for the area that will remain in effect until 7:45 p.m. Thursday. 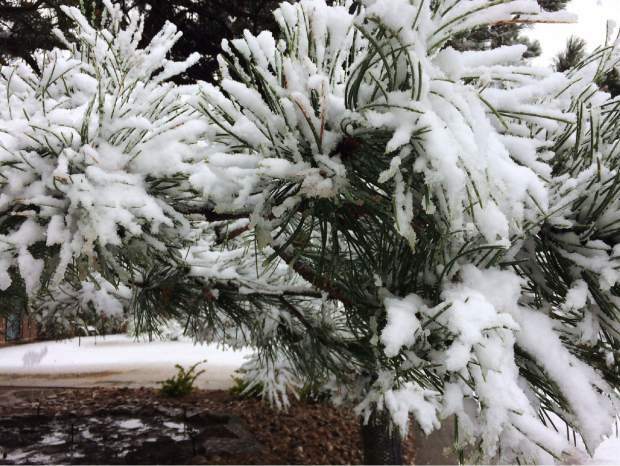 Snow started falling in Greeley and Windsor about 1 p.m. Thursday. A car slows down to drive through the growing pool of water at 50th Avenue and 11th Street in west Greeley. According to the National Weather Service, Greeley could see up to anotehr 3 inches of accumulation by Friday. 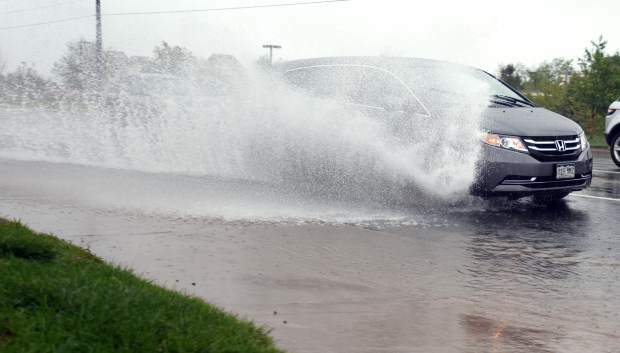 Water sprays up as a car passes through a large puddle along 47th Avenue in west Greeley. 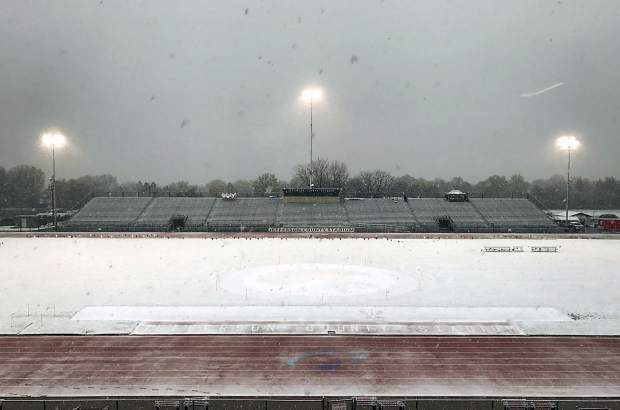 » The state track meet scheduled today at Jeffco Stadium in Lakewood has been canceled; state baseball for Friday also has been canceled. » The Fallen Officers Memorial ceremony scheduled for tonight at Bittersweet Park in Greeley also has been canceled due to the rain. According to a news release from the » Weld County Sheriff’s Office, organizers plan to host another event; details will be released when it’s available. 2 p.m. — Weld County Public Works has six crews working on drainage calls throughout the county. As of now, the county only has one road closure at this time: Weld County Road 49/Colo.392-Weld70. Crews have Type I barricades at multiple locations and are using cones on the less heavily traveled locations, according to a news release from the county. The county has sent a plow to Johnstown where snow is falling west of Weld 21, the release stated. Crews will continue to work throughout the evening, the release stated. Residents are asked not to drive past barricades. 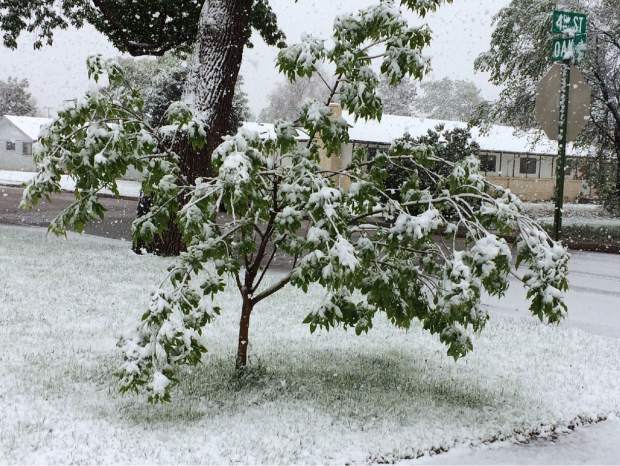 1 p.m. — Snow started falling in Greeley and Windsor about 1 p.m. Forecasters expect a rain/snow mix much of the day, with the precipitation turning entirely to snow after 4 a.m. Friday. 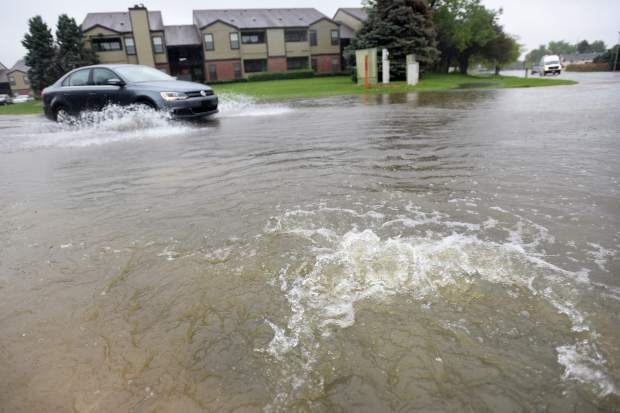 Additionally, the National Weather Service issued a flood advisory for Greeley, Windsor, Evans, Eaton, La Salle, Kersey, Galeton, Gill, Lucerne and Barnesville, which will be in effect until 7:45 p.m. Thursday. “At 12:35 p.m., Weld County Emergency Management reported 1 to 2 inches of water running across several roads. 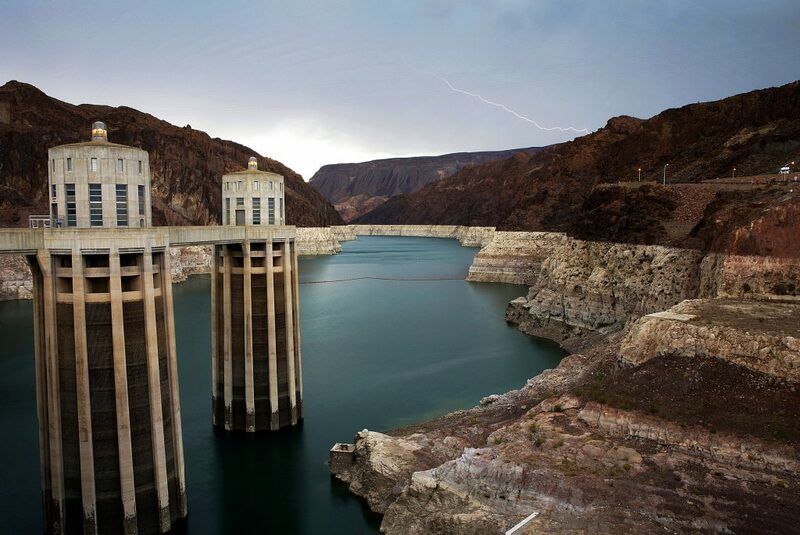 Irrigation ditches were full, detention ponds were filling up and water was running off fields,” the advisory stated. A flood advisory means river or stream flows are elevated, according to the weather service. “Excessive runoff from heavy rainfall will cause minor flooding of urban areas, highways, streets and underpasses as well as other drainage areas and low lying spots,” the weather service stated. 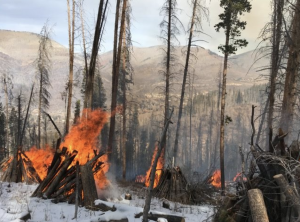 EARLIER — While a massive storm blankets the rest of Colorado with several inches of snow, Greeley’s higher temperatures have dumped in some cases more than 3 inches of rain in the last day, swelling area parks, drenching spring planting, and also putting a halt to various outdoor events. Residents can expect much more accumulation through Friday afternoon. In the last day, the Greeley area has received more than 2 inches of rain, making roughly 4.75 inches so far this month. “You’ve got two full weeks to go, so it will rain with this storm a ton more, so you’ll have a significant amount,” said Robert Koopmeiners, a meteorologist with the National Weather Service in Boulder. The area could see another 2 to 3 inches by Friday, but overnight temperatures could turn that into snow, he said. 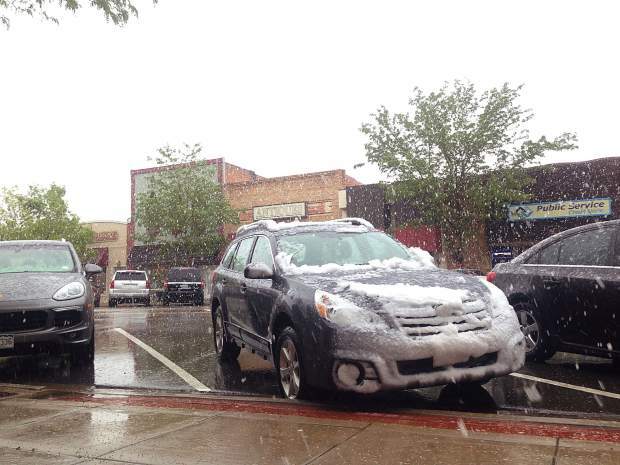 Snow has already hit the Windsor, and sleet had hit areas of west Greeley this afternoon. The National Weather Service reports there will be heavy snow in the mountains and the high foothills through Friday morning, especially near Rocky Mountain National Park. Snowfall totals are expected to be 1 to 3 feet by Friday evening, the weather service reports. 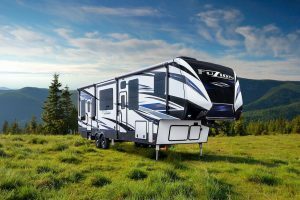 Heavy, wet snow is common with spring storms, and it can overwhelm branches and prematurely prune limbs and branches, and freeze new plantings. Ken Olsen, co-owner of Eaton Grove Nursery in Eaton, said newly planted vegetables and flowers are especially vulnerable. With the potential for freezing temperatures that would bring snow, new plantings should be covered. “You should cover them with a cloth blanket or better yet, turn pots upside down over the plants, that way they won’t get mashed down by any snow,” Olsen said. New trees, too, will be harmed by pooling water. The roots, Olsen said, need oxygen. 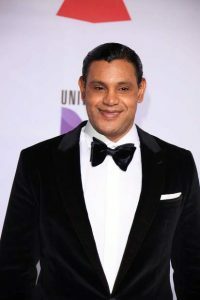 When the rain ends, he said, it’s best to cultivate the soil around the roots to help them dry out, and to keep sprinkler systems off for several days to allow the soil to dry out. Low lying areas may be prone to localized flooding and rivers are expected to swell, the weather service warns. County officials already are bracing for flooding along the Poudre and South Platte Rivers. Since 6 a.m., the Poudre River, for example, has risen a foot to 5.64 feet. Flood stage is at 8 feet. The good news is that warmer, drier weather is expected over the weekend, giving a slight chance for plants to recover somewhat before another system coming out of Canada for a wetter and cooler Tuesday and Wednesday, the weather service reported. 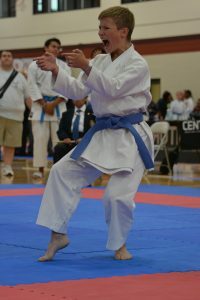 This story will be updated. Check back at http://www.greeleytribune.com.